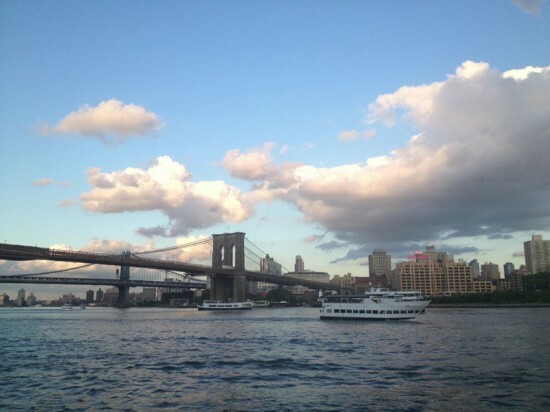 When it opened in 2013, the Squibb Park Bridge that zigzagged between Brooklyn Heights and Brooklyn Bridge Park instantly became one of the most thrilling pieces of the waterfront retreat. The HNTB-designed pedestrian bridge was designed to have some bounce in it, so getting to the park was more than a typical pedestrian experience, it was a fun little adventure. At least for the humans voyaging across it—dogs hated it. The petrified, why-are-you-doing-this-to-me looks on their faces as the wood structure ebbed and flowed were haunting. But while the Squibb Park bridge may have seemed a little precarious, everything was surely fine. The movement was just part of the fun. The Brooklyn Bridge Park said so right on its website: "Walk across the award-winning Squibb Park Bridge and you may notice a little spring in your step. That’s because it was designed to be lightweight and flexible like the trail bridges in our state and national parks." See, totally stable. Well, maybe not. By last summer, the bridge wasn't just springing, it was swaying. So in August, the bridge was closed. That was supposed to be temporary, but the bridge is still off limits today. Back in February, the Brooklyn Paper reported that the structure needed $700,000 in repairs—nearly a quarter of the bridge's initial cost. Those repairs were supposed to wrap up in the Spring. So now Spring has arrived—almost peak Brooklyn Bridge Park season—and the bouncy bridge is still inaccessible. “At this point, because of the movement we notice, it would be overly optimistic to say we could solve this in two to three weeks," Regina Myer, president of the Brooklyn Bridge Park Corporation told the New York Times. Engineers are apparently studying the structure's movements. The bridge is still expected to open later this spring, but no exact date has been given. And there has not been a full accounting of exactly what caused the problems. A spokesperson has said the issue could come down to a "misalignment." 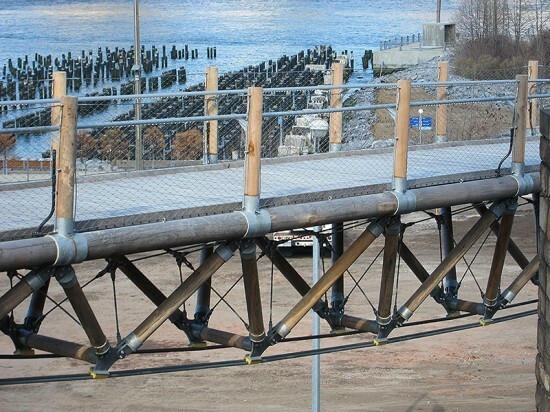 Park officials told the Times that the solution will include installing cross braces, which a park spokesperson said would make the bridge "a little less bouncy than it was before." One would hope. 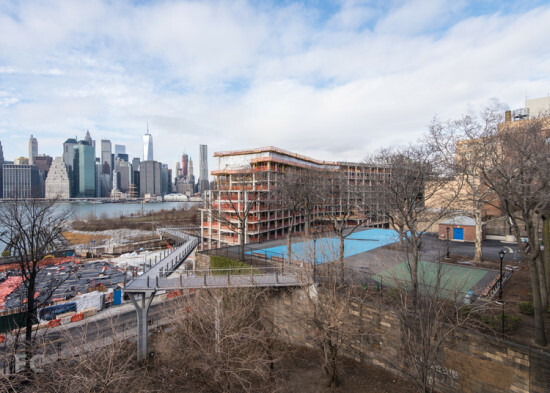 In our recent story about the current development surge happening in and around Dumbo, we touched on the controversy surrounding the Pierhouse—an under-construction hotel and condo complex next to the Brooklyn Bridge. The Marvel Architects–designed building, which will help cover Brooklyn Bridge Park's maintenance costs, has riled up local residents who say it is blocking their views of the iconic bridge. The Pierhouse was expected to top out at 100 feet, but was pushed about 30 feet higher due to a bulkhead. 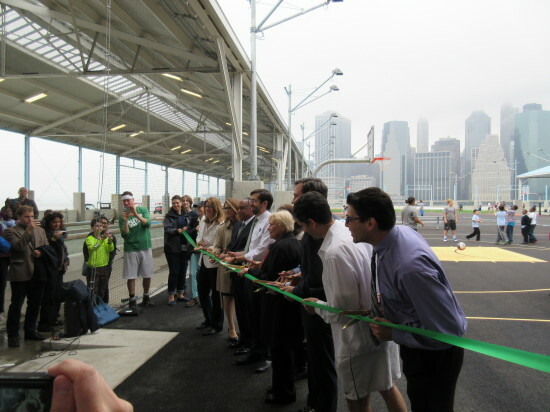 The Brooklyn Bridge Park Corporation (BBPC) maintains that the building's design is exactly what was presented to the community in 2013. 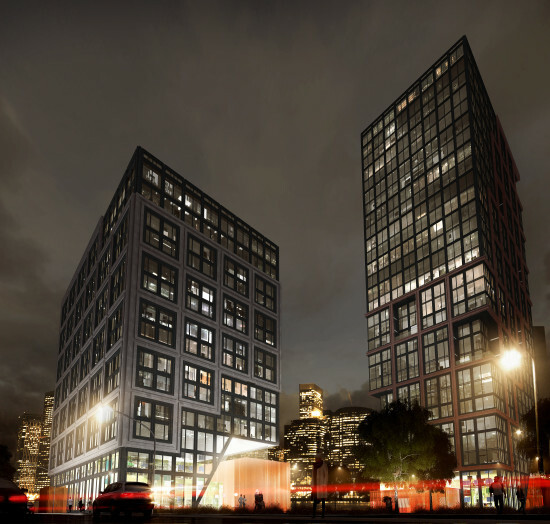 But facing growing criticism, the BBPC went ahead and asked the site's developer to double-check that the building fully complied with the Brooklyn Heights Scenic View District. So at the end of January, the Department of Buildings filed a stop work order at the site so everything could be evaluated. Now, a few weeks later, work is expected to pick back up at the Pierhouse, but with a few concessions in regards to height. 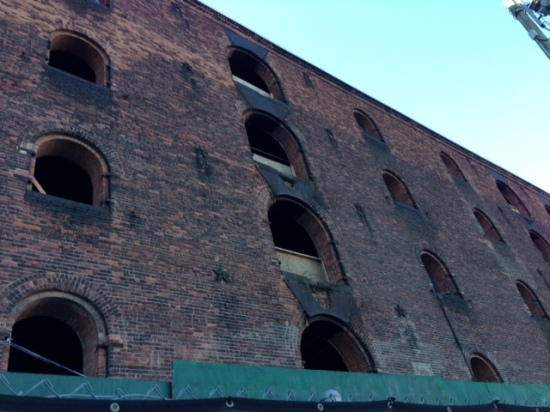 A spokesperson for the project told the website New York YIMBY that two parapet walls will be removed and the building will be lowered by 1.5 feet. 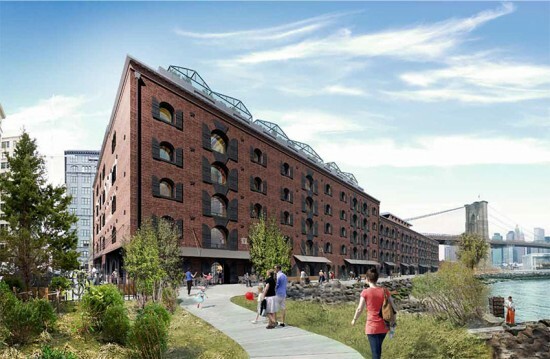 As AN covered earlier this month, Mayor de Blasio’s plan to bring affordable housing to Brooklyn Bridge Park has received steep opposition from local groups in neighboring Brooklyn Heights. They contend new housing development will eat up public space and that under-market housing would not provide necessary funding for park maintenance. Under a Bloomberg-era plan, revenue from private, market-rate development would help cover upkeep at the Michael Van Valkenburgh Associates-designed park. Under de Blasio, 30 percent of the two proposed towers for the park–one 31 stories and the other 16–would be subsidized. The groups opposing that plan have now formalized their opposition against it. According to the Wall Street Journal the park neighbors opposing the project filed a motion in State Supreme Court in Brooklyn on Friday to stop the city from selecting a developer for the project. The publication reported, "the suit being heard Friday cited the enormous popularity of the park, the growth of the surrounding neighborhoods, increasing traffic and overcrowded schools. It seeks to force the park corporation to redo a required environmental impact statement that dates to 2005. The suit also said the original plans required that housing be developed only if it was needed to pay for the park." In the meantime, Gothamist reported that the rising condos designed by Marvel Architects are already blocking views of the Brooklyn Bridge and Midtown Manhattan. For over 120 years, the Municipal Art Society has been an important organization in New York City's efforts to promote a more livable environment and preserve the best of its past. It's successful preservation campaigns and advocacy for better architecture—such as its advocacy to rebuild a better Penn Station—are well known. Now the organization has announced its annual MASterworks Awards, and of the nine buildings selected this year as honorees, many are in Brooklyn, confirming that borough's continuing upgrading evolution. The Weeksville Heritage Center (Caples Jefferson Architects) has won the top honor, “Best New Building,” while “Best Restoration” goes to the Englehardt Addition, Eberhard Faber Pencil Factory (Scott Henson Architect). 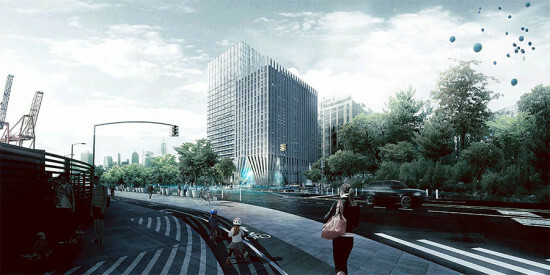 The “Best Neighborhood Catalyst” award will be given to the BRIC Arts Media House & Urban Glass (LEESER Architecture), and “Best New Urban Amenity” will go to LeFrak Center at Lakeside (Tod Williams and Billie Tsien Architects). 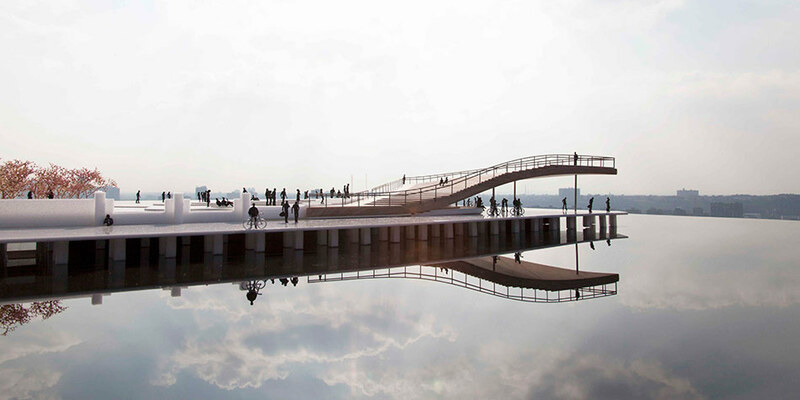 Brooklyn Bridge Park (Michael Van Valkenburgh Associates) will be recognized as “Best Urban Landscape.” Additionally, this year’s MASterworks also recognized two new design categories. “Best Adaptive Reuse” will be awarded to The Queens Museum (Grimshaw Architects) and the NYC DDC Zerega Avenue Emergency Medical Services Building (Smith-Miller Hawkinson Architects) will take home the award for “Best New Infrastructure.” Finally, “Best Green Design Initiative” honors will be given to Edible Schoolyard at P.S. 216 (WORKac) and P.S. 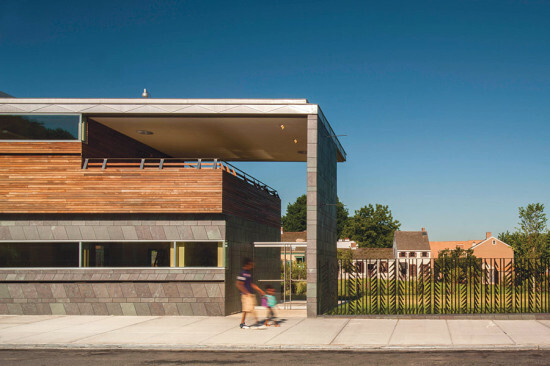 261 School and Community Playground (SiteWorks Landscape Architecture). The MASterworks Awards, recognize projects completed in the preceding year that exemplify excellence in architecture and urban design and make a significant contribution to New York’s built environment. As Brooklyn Bridge Park opens two new piers, a planned green space five miles south continues to sit empty. Work began on Bush Terminals Piers Park in Sunset Park in 2009—just months after Brooklyn Bridge Park got started—but has been behind construction fencing ever since. The park was slated to start opening last fall, but that did not happen. And it's still not clear when it will. The Brooklyn Bureau reported that community members are becoming increasingly frustrated with the delays and the lack of explanation they are getting from the New York City Economic Development Corporation (EDC). At a recent community board meeting, representative from the EDC reportedly said they are “close” on completing the first phase of the park. Ninety-five percent there, they said. The slow pace was blamed on problems with construction and permitting. 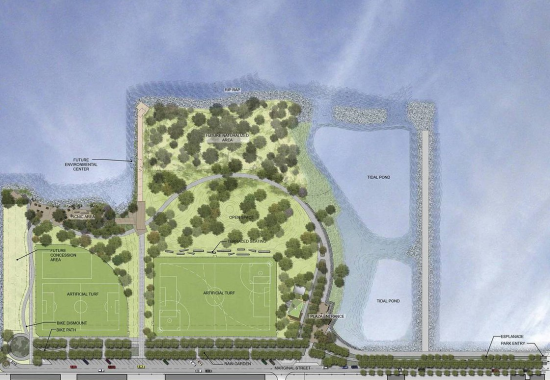 When the park finally does open, the formerly brownfield site will offer tidal ponds, wetlands, recreational space, picnic areas, and sports fields designed by AECOM and Adrian Smith Landscape Architecture. There is also a sustainable comfort station by Turett Collaborative Architects. But all of that is less than what was originally planned. “There’s no children’s playground as planned, nor an environmental center that the original plan envisioned. Bases for lighting have been installed, but not the fixtures,” reported the Bureau. As for Phase 2 of the park, there is no word on that at all. Taking the podium at Pier 6 in Brooklyn Bridge Park, New York City Representative Nydia M. Velázquez introduced new legislation, called the "Waterfront of Tomorrow Act," to protect and fortify New York City's 538-miles of coastline. The bill would instruct the Army Corps of Engineers to come up with an in-depth plan to stimulate economic growth and job creation, update the ports, and implement flood protection measures. Sandwiched between Red Hook Container Terminal and One Brooklyn Bridge Park, a large residential development, the pier was an appropriate place for the Congresswoman to announce legislation that addresses the city's needs to bolster its shipping industry while also taking steps to mitigate flooding and ensure the resiliency and sustainability of its residential neighborhoods, parkland, and businesses. "I think the part [of the bill] that was the most exciting was about protecting New York City from future floods, and most importantly talked about hard and soft solutions. Different parts of NYC will need different solutions," said Rick Bell, Executive Director for AIA New York Chapter Center for Architecture. "This whole announcement talked about multifaceted approach." The bill is divided into four sections that propose flood protection and resiliency measures, a national freight policy, and "Green Port" designations and a grant program to promote the environmental sustainability of the shipping ports. The Army Corps of Engineers, in collaboration with the National Oceanographic and Atmospheric Administration, will be charged with coming up with a strategy to protect the waterfront from severe weather patterns and rising tides, including tide gates, oyster reef restoration, and wetland restoration. "Whether it is commerce, recreation, transportation, or our local environment, New Yorkers' lives are inextricably linked to the water that surrounds us," Velázquez said at the announcement. "Investing in our ports, coasts and waterfronts can improve our City and local communities." The timing of this bill is up in the air, but it will likely enter the conversation in September when Congress returns from the August District Work Period to discuss new legislation aimed at enhancing the nation's waterways.